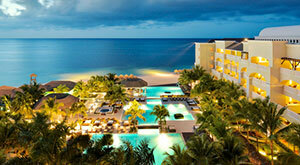 Save up to $150 + more at Iberostar Hotels & Resorts. Book a flight + hotel package of $1,500 or more to Iberostar Hotels & Resorts in Mexico or the Caribbean, and save up to $150 when you use the promo code 150IBERO at the time of booking. * Plus, take advantage of additional savings like children stay free, resort coupons, and private transfers at select resorts. Hotel offer blackout dates: 4/24/19 – 4/27/19 and 11/1/19. Free Club Mobay Airport Lounge access is included. Valued at $80 per person. Hotel offer blackout dates: 11/1/19. Hotel savings and resort coupon offer blackout dates: 4/24/19 – 4/30/19 and 8/22/19 – 11/1/19. Children stay free offer blackout dates: 4/24/19 – 6/30/19 and 8/22/19 – 11/1/19. Hotel savings and resort coupon offer blackout dates: 4/24/19 – 4/30/19 and 11/1/19. Free private transfers for up to six passengers are included. Hotel offer blackout dates: 4/24/19 – 4/30/19 and 11/1/19. *Up to $150 per reservation promotion code savings apply on flight + hotel vacation packages of $1,500 or more to Iberostar Hotels & Resorts in Mexico or the Caribbean. 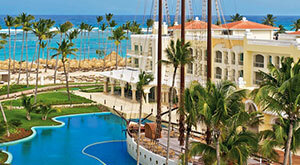 Save $100 on packages totaling $1,500 – $2,999; Save $150 on packages totaling $3,000 or more. Savings is reflected in the package price when using promotion code 150IBERO at the time of booking and is based on total package price before discount is applied. Length of stay for flight and hotel components must match. Promotion code intended for redemption by individual consumer only. One-day advance purchase is required. Savings valid if booked 4/23/19 – 5/6/19 by 6:00 p.m. CT for travel 4/24/19 – 11/1/19. 1One child, age 12 or under, stays free when staying with two paying adults in the same room. 2The value of the resort coupons varies depending on length of stay and resort. Offer is issued as coupons for limited discounts on select amenities. Purchases may be required to take advantage of some of these offers. Use your resort coupons towards experiences such as room upgrades at check-in, romantic dinners, spa treatments, and more. Redemption information and details are provided at check-in. Resort coupons may not be redeemed for cash. Resort coupons are non-transferrable and must be used during the length of stay. Offer is based on double occupancy. Valid only for new bookings. Additional restrictions or exclusions may apply. Offers are based on availability. Offer is not available for group bookings. Subject to change without notice. 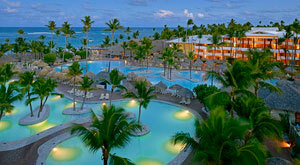 3Iberostar Selection Bávaro: Hotel offer is not valid in Junior Suite Family, Junior Suite Star Prestige, or Junior Suite Priority Location Star Prestige room categories. 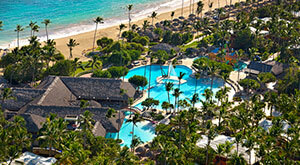 Iberostar Punta Cana and Iberostar Dominicana: Hotel offer is not valid in Junior Suite Star Prestige, Double Family, Double Star Prestige, or Family room categories.